Joseph Liebman was a Jewish-American potato farmer. 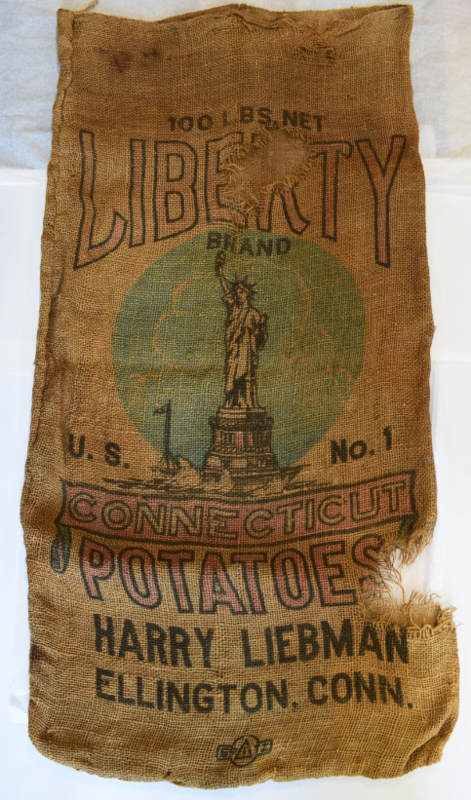 One of many Jewish immigrants who settled on Connecticut farms during the first half of the twentieth century, it’s no wonder that Liebman included a depiction of the statue of liberty on this sack. Liebman’s sack is an example of the many diverse artifacts in the Jewish Historical Society of Greater Hartford’s archive. In the summer of 2018, interns from Trinity College catalogued and photographed several of these artifacts including memorabilia from synagogues and organizations, belongings of prominent community leaders, and ephemera documenting local businesses, events, and everyday life. We plan to feature one artifact on our website each month. Stay tuned!